Getting ready to give thanks. The Greens At Centennial Campus. Getting ready to give thanks. Whether you’re expecting a houseful or keeping it a little more intimate this Thanksgiving here are some clever, charming ideas to add to your home. 1. Make your own cornucopias out of waffle cones. 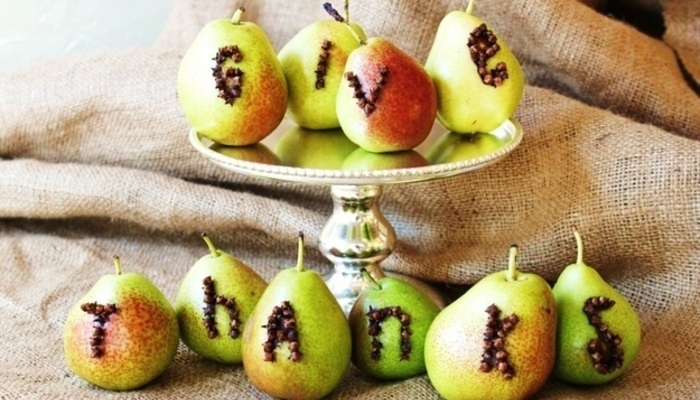 This simple idea is a great addition to the table or gift to send home to your guests. Soak the tip of the waffle cone in warm water for about 20 seconds; put a little water on the inside of the cone too. Remove from water and microwave the wet waffle cone for about 20 seconds. Roll the softened tip of the cone around a clean pencil or straw and hold it in place for about 20 seconds. That’s it! Fill with whatever you desire; trail mix is a festive healthy alternative. 3. Assign seats for your guests using these easy organic ideas. Use a sharpie on a leaf or make a wreath with rosemary for a fresh fragrant touch.